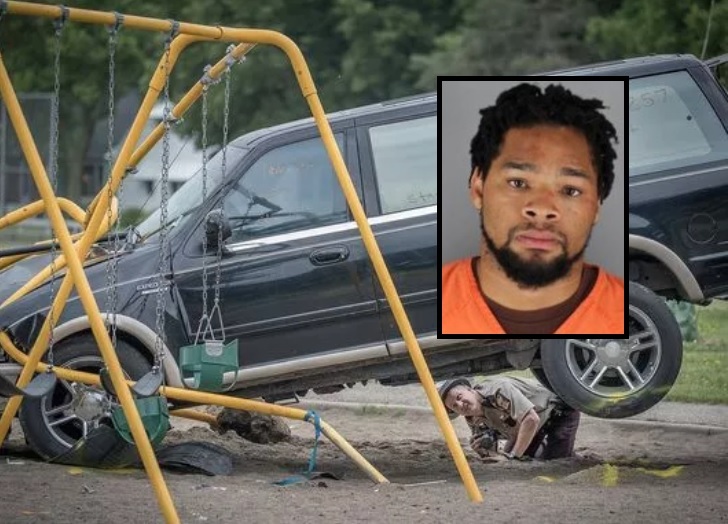 Minnesota state troopers were pursuing an unlicensed driver when he rammed into a Minneapolis playground and injured three young children, one of them suffered a broken hip and neck. The horror unfolded Monday when state troopers tried stopping 27-year-old Kabaar Powell during a routine traffic stop. Powell refused to stop and fled tearing through a tennis court before smashing into the playground near the Jenny Lind Elementary School. Powell struck young Kayden, Konnor and Lillianna Peltier, all three siblings before coming to a halt in a tangled mess of metal poles and swings. The driver was arrested and jailed without bail on suspicion of criminal vehicular operation and fleeing police but more charges are expected to follow. The grandmother of the three victims Diana Peltier said, "I almost fell over, I’m like no, no, this is not happening Larry, this is not happening." Peltier's son was caring for his seven children while his wife was taking a test at Jenny Lind Elementary School. The children were playing at Bohanan Park which is just adjacent to the school. Around 9:30 a.m., a vehicle plowed into the siblings. State Patrol Captain Jason Bartell said, "The suspect crashed into a group of kids." Two of the siblings were rushed to North Memorial Medical Center with critical injuries, the younger brother, Kayden, received a broken hip and a broken neck. According to ABC 5 quoting a criminal complaint, "Kayden suffered a Grade 4 spleen injury, meaning a severe laceration to the organ, calling for his spleen to be removed. Kayden also suffered a pelvic fracture, a cervical spine fracture and intracranial bleeding. He requires continued care." "He has a broken hip and his neck is broken and he’s the 2-year-old," Peltier said. After ramming into the children, Powell jumped out of the vehicle and fled the scene while attempting to evade the troopers. His callous disregard is what upset the children's grandmother the most. "I’m angry with this man, why did he do this and didn’t have a driver’s license," Diana Peltier said. "What was he doing with a gun in his car? This is why he was probably running." "Why was he running, why didn’t he just pull over and stop? Why do my grandkids have to suffer for this crap, this is just not right," she said. Powell's license has been suspended since 2014 and a search of the vehicle revealed a firearm which he is not licensed to own and drug paraphernalia. More charges are expected to follow pending the investigation. Hint: Minnesota and " Kabaar Wahleen Asim …"